Lino Tagliapietra was born in Murano, a small island in the Venetian lagoon, in 1934. At the age of 11 Lino began his apprenticeship with the great maestro Archimede Seguso and by the age of 21 he had mastered the age-old glass blowing techniques and worked his way up to the title of maestro. Over the next 25 years Lino worked in association with several other master glass blowers at various factories on Murano. By the late 1960’s and 1970’s he was developing his own designs and creating them under the auspices of the factories in which he worked. In 1977 Lino became head glassblower for a new glass company, Effetre International. Lino Comes to the U.S.! In 1979, at the invitation of Dale Chihuly, Lino came to teach a summer workshop at the recently created Pilchuck School, north of Seattle. Thus began a long history of sharing his centuries old Muranese glassblowing technique with a generation of eager young American glass artists. Lino, in turn, was excited by the youthful enthusiasm and experimental mind set of the glass artists from the U.S. Influenced by the Abstract Expressionist school of painting these American artists were long on creative innovation but short on technique. 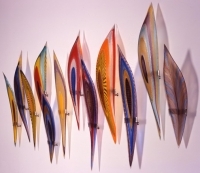 Lino Tagliapietra, on the other hand, was a master technician coming out of a rigidly traditional approach to glass art and he loved the passionate exploration of new ideas and forms of the young American glass artists. Anecdotally, Lino’s first trip to the U.S. involved several flights and some missed connections and took most of two days. He arrived in Seattle speaking no English and was whisked off to Pilchuck where, upon his arrival, he was informed that his students were waiting for him at the hot shop for his first scheduled class. Thus, Lino began teaching his first class, jetlagged and sleep deprived, and as excited as he had ever been about anything in his life. His students loved him! During the 1980’s Lino was best known for his collaborative work with prominent American glass artists such as Dale Chihuly and Dan Dailey. But in the 1990’s, although he continued to teach and to collaborate with other artists, Lino became increasing well known for his own unique works of glass art. In 1987 Holsten Galleries became the first gallery in the U.S. to show the work of Lino Tagliapietra. Since that time we have worked closely with Lino to provide his very best pieces to hundreds of glass collectors. Today Holsten offers an extensive selection of some of the finest of the Maestro’s works. All of the Lino glass for sale seen on this website are available through Holsten Galleries. Please feel free to contact us for price information or for more images of these pieces, including close up shots. Today Lino is widely recognized as the world’s greatest living glass blower. Even Dale Chihuly has given him that accolade. Indeed, many consider him to be one of the greatest glass artists of all time, and possibly the greatest. 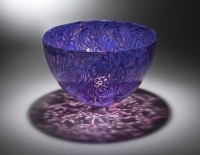 Lino Tagliapietra blown glass works are in the collections of many major glass museums throughout the world and are sought after avidly by collectors of glass art. 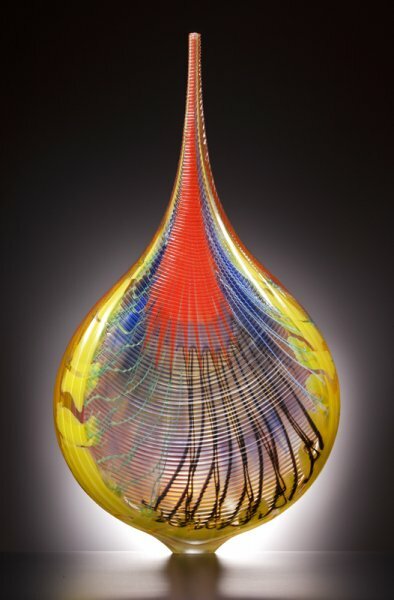 Some of the public collections which include Lino Tagliapietra blown glass art are the Carnegie Museum of Art in Pittsburgh, the Columbus Museum of Art in Columbus, the Corning Museum in New York, the Hokkaido Museum of Modern Art, in Japan; The Museum of Glass in Tacoma, Washington; the Metropolitan Museum of Art in New York, the Palm Springs Art Museum in California, The Renwick Gallery in Washington, D.C.; the Tokyo National Modern Art Museum and the Victoria and Albert Museum in London. Lino tends to create his blown glass sculpture in various series. Often his series are named after famous places that Lino has visited: Bilbao, Seattle Sunset, Maui and Fuji are examples of these series. Others of Lino Tagliapietra’s glass series are named for their familiar shapes: Dinosaur, Foemina (Italian for female), Angel Tear and Masai (after the Masai shields) are examples of Lino glass pieces whose shapes either obviously or more subtly refer to specific forms. *Numerous styles of engraving or surface cutting. *Cane work (the use of thin threads of glass) which are incorporated into the hot glass. *Murini (glass tiles that are spread out in intricate colorful designs on a metal table and rolled onto the bubble of hot glass). 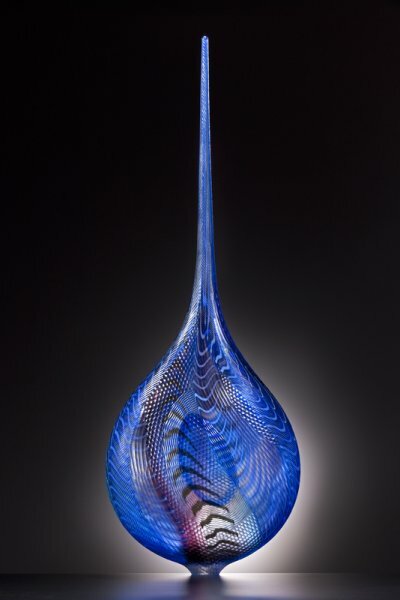 Holsten Galleries is proud to be one of the few glass galleries in the U.S. to represent Lino Tagliapietra. Holsten Galleries has represented Lino Tagliapietra for over 30 years and has a large selection of Lino Tagliapietra glass for sale at all times. Holsten has been privileged to present Lino’s blown glass art at numerous major art expositions around the country, including in Chicago, Los Angeles, Scottsdale, Santa Fe and Palm Beach. Please contact us with any questions you may have on the glass art of Maestro Lino Tagliapietra.